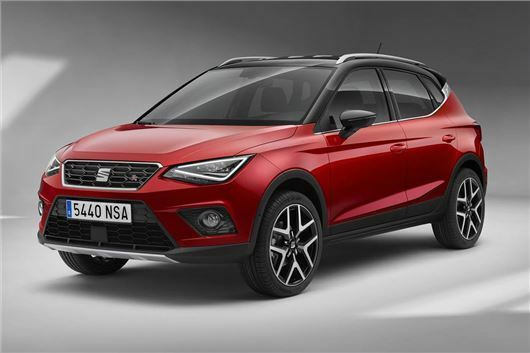 SEAT has confirmed its Arona will cost from £16,555, with the first cars arriving in the UK in mid-November 2017. Prices for the Arona top out at £24,640 for the Xcellence Lux model with a diesel engine and DSG automatic transmission. Interestingly, the range has been simplified by the removal of options packs and extras. Instead there are just three choices for buyers to make – engine, trim level and colour. That said, there are six trim levels to choose from. SE is the basic equipment grade, but it comes with metallic paint, a bi-colour roof, 17-inch alloy wheels, air conditioning, a five-inch touchscreen, DAB radio, Bluetooth, cruise control and auto emergency brakes. SE Technology adds a larger, eight-inch touchscreen with navigation, Apple CarPlay and Android Auto, along with a wireless charger. Moving up to an FR model adds plenty of styling extras including FR specific styling and alloy wheels, sports seats, tinted glass, selectable drive modes and LED headlights. Convenience extras include dual-zone climate control and auto wipers. There’s also an FR Sport grade with larger alloys, Alcantara upholstery and adaptive suspension dampers. Xcellence ditches sporty looks in favour of a more sophisticated, upmarket look, but gains similar extras including LED lights and dual-zone climate control. It also gains keyless entry and go, blind spot detection and rear cross traffic alert. >> How do SEATs perform in Real MPG? At the top of the range is Xcellence Lux, which has 18-inch alloy wheels, Alcantara upholstery, front parking sensors, a reversing camera and park assist. There are also ‘First Edition’ variants of Xcellence and SE Technology, which add a few extras for those keen early-adopters. The engine range consists of a 1.0-litre TSI petrol with 95PS or 115PS, a 1.5-litre TSI petrol with 150PS and a 1.6-litre TDI diesel with 95PS or 115PS. Those who want an automatic can get a DSG linked to either the 115PS petrol or 95PS diesel. Yet another new model launched that costs a lot more than everyone was expecting. Almost 17 grand for a super-mini class car on raised suspension with 95bhp doesn't strike me as good value for money......but nowhere near as extortionate as the new VW Polo starting from 14 grand with a weedy 64bhp engine! Yet another new model launched that costs a lot more than everyone was expecting. Almost 17 grand for a super-mini class car on raised suspension with 95bhp doesn't strike me as good value for money......but nowhere near as extortionate as the new VW Polo starting from 14 grand with a weedy 64bhp engine! I love it when 64bhp is decribed as "weedy", I'm old enough to remember when you thought you were doing well to have 40bhp in a car that size!